The last years of the 19th century saw Russian military dress becoming increasingly austere. But when Russia’s last tsar, Nicholas II, came to the throne, he decided that the uniforms were lacking in glamor and needed the incorporation of elements that reflected Russia’s past military glory. During his 1881-1894 reign, Tsar Alexander III extended his taste for simplicity to his army too. Fancy braiding and plumes were stripped from the uniforms of soldiers and officers, and resplendent Guards outfits and other extravagant regular-issue items were consigned to the past. Not for long, however. Alexander’s son Nicholas II, the last Russian Emperor, shared the passion of many of his predecessors for war games, parades and flashy uniforms, and began reviving some traditions. Nicholas II regarded ceremonial uniform elements as an integral part of military life – and all the better if they bore reminders of past glories. Shortly after he took the throne in 1894, the new tsar initiated a reform of cavalry uniforms. The new outfits resembled those worn by the Russian troops who took Paris in 1814, with close-fitting, double-breasted jackets and colored trimming on the collar and cuffs. And in place of the simple leather sword belt introduced by Alexander III, the braided ceremonial galloon made a comeback. However, in 1904 the landmark decision was also taken to develop khaki uniforms for soldiers and officers. In the meantime, the plain white army uniforms and caps of the previous reign were retained, with disastrous results: When the Tsar’s forces went into battle in the 1904-05 Russo-Japanese they made conspicuous targets for the enemy gunners. So much so that soldiers took to dying their own uniforms to reduce their visibility. In 1907, the entire army was kitted out in khaki uniforms, and a peaked cap was finally adopted as the principal headgear. Wide fatigues that tucked into boots completely replaced tight britches, and only cavalrymen retained their gray britches with colored piping. The officers’ white tunic and shirt were replaced by drab uniforms with breast pockets and metal buttons, while soldiers were issued with tunics with pockets but sewn with buttons made of compressed leather. The army was also issued with new dress uniforms for ceremonial occasions. Soldiers wore double-breasted jackets with colored piping, officers’ regiment numbers were embroidered in gold on their jackets, and generals wore a special decoration in the form of oak leaves. In a bid to boost morale in the recently defeated forces, a number of more distinctive uniform elements harked back to Russia’s glorious military past. Some units were issued with the long-forgotten shako cylindrical hat, modeled on those worn by Russian soldiers in 1812. The Grenadier Regiment received an 18th century-style gold braid aiguillette on the right shoulder bearing the monogram of Catherine II. Officers’ silver sash belts resembled those worn under the revered military commander Alexander Suvorov in the 18th century. But the outbreak of the First World War in 1914 gave the Russian soldier no occasion to savor the new dress uniform, which was stored away since it had no application at the front. Officers had to wear the soldier’s uniform, while all bright or shiny elements like buttons and stars on the shoulder straps were painted in drab colors to make them invisible to the enemy. The braided sword belt was replaced with a leather one that crossed at the back and attached to a belt fitted with a revolver holster and a sheath for an edged weapon. The ranks also began to wear a tunic modeled on that worn by the allied British Army. Material shortages also brought changes in uniform design. Troops on the Caucasian front were allowed to wear the traditional cherkeska homespun gray cloth jacket, while leather shortages led to the broad replacement of long boots with short boots and puttees. But such was the confidence that Russian troops would again parade through the defeated enemy capitals of Berlin and Vienna that special dress outfits were made in advance. In another echo of past eras, the tall budenovka felt hat was specially modeled on the ancient Russian warrior’s helmet for celebrations marking the anniversary of the Romanov dynasty. A long greatcoat sewn with a vertical array of straps also evoked the past archer’s caftan, and was meant to symbolize the triumph of the Slavic spirit over the perennial German enemy. 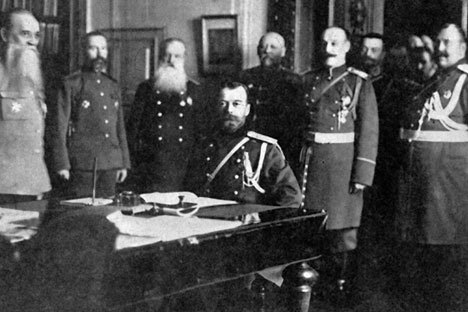 The war dragged on beyond all expectations, however, and ultimately led to the 1917 Revolution. The newly designed uniform was inherited by the Red Army, and in the years to come came to symbolize Soviet might.